JOHOR BARU: Eight out of 10 Johoreans want the return of English-medium government schools and a “one school for all concept”, according to a survey. According to the survey published by ISEAS-Yusof Ishak Institute in Singapore titled “Johor Survey 2017: Views on Identity, Education and the Johor Royal Family”, 82% of respondents supported the move to bring back English-medium schools. The survey showed that support was strong across all demographic segments, even among Malay and rural respondents who in the past were not supportive of the policy to teach Mathematics and Science in English. Only 18% of the respondents disagreed. The study suggests that the very strong support among Johoreans for the introduction of public English-medium schools was due to their cognisance of the success of Singapore’s national system in producing graduates who were competent in English and internationally employable. As for the “One School for All” concept, the survey concluded that there is strong support among Chinese and Indian respondents for it. 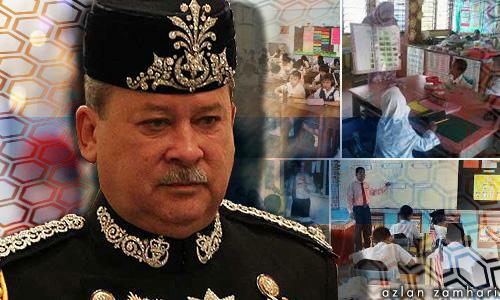 Johor ruler Sultan Ibrahim Ismail has warned that without a single stream education system that uses English as the medium of instruction, a ‘5Malaysia’ will emerge instead of 1Malaysia. “The Malays go to national schools, where the Chinese feel alienated, while the Indians go to Tamil schools. Where is the unity?” he asked in an interview published by The Star today. “All this is driving the races apart,” Sultan Ibrahim added. Early last month, he said Johor should emulate Singapore’s single stream education system, which uses English as the medium of instruction, as it has succeeded in fostering unity, regardless of race or religion. This has also set the island republic ahead of Malaysia, the ruler said in the interview, citing the example of how Singapore students were faring very well in mathematics and science subjects. The Johor Sultan also criticised Malaysian politicians for remaining in self-denial or trying to play politics with education. “They want to be heroes of their races. They talk about nationalism but in the end, do they send their children to boarding schools in Australia and the United Kingdom to learn in the Malay medium?” he questioned. SINGAPORE – Eight out of 10 Johoreans want the return of English-medium schools in the state, a recent survey showed. The survey by Singapore’s Iseas-Yusof Ishak Institute showed that the support (82 per cent) for English-medium schools cuts across all races in the state. “This support is strong across all demographic segments, even among Malay and rural respondents who in the past were not that supportive of the Dual Language Programme (DLP) to teach mathematics and science in English,” said according to the findings. The survey, which was released on November 13, said the support was highest among Indians at 88 per cent, followed by Chinese (87 per cent) and Malays (77 per cent). The survey said Johoreans’ preference for English-medium schools could be due to the success of Singapore’s graduate competency in the language, making them more internationally employable. The findings also debunk the belief the Chinese and Indians are reluctant to support a single stream education system in the country. “The strong support among Chinese and Indian respondents for the ‘One School for All’ concept contradicts the prevailing belief that they do not support the idea because it would mean closing down Tamil and Chinese schools,” according to the survey. The study noted the strong support from Chinese and Indians for a single stream education system could be due to the impression that Johor will introduce a system modelled after Singapore’s English medium school system which was actively promoted by Johor ruler, Sultan Ibrahim Sultan Iskandar. This entry was posted in Uncategorized and tagged Our education makes us ‘5Malaysia’., sultan of johor: English as medium of education. Bookmark the permalink. I agree as well.I went to English school in the 50s.my best friend was an Indian and a Chinese.AH Heng and Krishnan.We were together from form 3 to form 5.Always together weekend, listening to music and mengurat girls.It was really fun.My brother’s friend was also a Chinese boy,Ah Seng. Ah Seng slept many times at our house and makan as well.My grand ma likes him..